Discover the excitement of driving the E-PACE. Offering a unique balance between agility and ride comfort, the fully independent suspension system has a sophisticated multi-link rear suspension design. Advanced driving technologies including Active Driveline and Adaptive Dynamics ensure the E-PACE delivers an agile, controlled ride. Designed to make driving safer and more enjoyable, the state‑of‑the-art technology of the E‑PACE includes our Touch Pro infotainment system featuring a 10” tablet-style touchscreen. To deliver a personalized experience, Smart Settings* remembers a number of settings saved to each driver’s profile, including which media you like to play on your journey. The deep center console with removable cup holders, provides a highly flexible space. The large glove box is great for all those essentials you want to keep close at hand and both deep front door bins have been sculpted to carry a range of items. Agile handling, head-turning good looks and outstanding practicality – this is the very essence of the E-PACE. Features include all‑round exterior LED lighting, state-of-the-art Driver Assistance systems and a 10” touchscreen that delivers rich audiovisual infotainment. The E-PACE S adds a beautifully crafted grained leather trimmed interior. Enhanced technology includes Connect Pro, featuring a 4G Wi-Fi Hotspot and Navigation Pro, allowing you to save your favourite places and use pinch and zoom gestures for simple map exploration. The Park Pack helps you park and manoeuvre safely and securely..
An innovative combination of refinement, functionality and advanced technology. 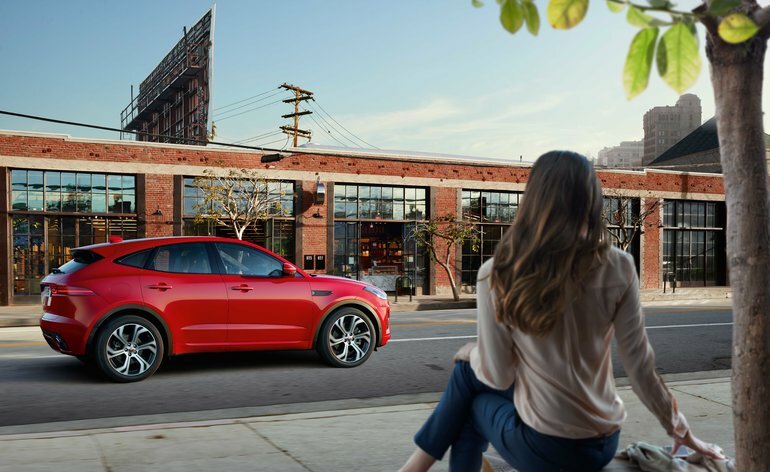 The E‑PACE SE comes with 14-way memory front seats, powered tailgate and the superb Meridian™ Sound System. To make every journey even safer, more relaxing and more enjoyable, the E‑PACE SE also includes the Drive Pack. The ultimate expression of E‑PACE – Windsor leather seats with 18-way memory for the driver and front passenger, Keyless Entry and gesture tailgate. The 12.3” Interactive Driver Display ensures clarity and smooth-moving, pin sharp graphics. Only available for the first model year, the First Edition includes exclusive design details including 20” split‑spoke ‘Style 6014’ alloy wheels with Satin Grey Diamond Turned finish and a unique Ebony Windsor leather interior with Flame Red twin‑needle contrast stitching.